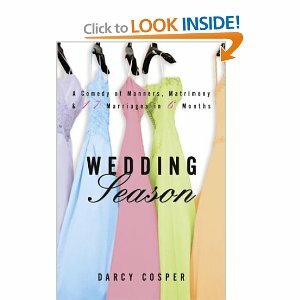 Wedding Season by Darcy Cosper is the book I finished reading on Monday. It is the first of a few that B's mom left me while she was visiting last week. I rate this book a C-. Wedding Season is about a 30 year old woman living life in NYC as a ghost writer. She has been dating her current boyfriend--Gabe--for the past two years and couldn't be happier. When her parents were divorced at a young age, Joy decided then and there that she would never make a promise that she did not keep or could not keep. This is the foundation that led Joy to become strongly anti-marriage. She did not want to become a slave to the outdated tradition that, more often times than not, ended horribly. She felt herself lucky to have found such a great guy who felt exactly the same way she did. However, Joy finds herself in the middle of an insanely busy wedding season. With 17 weddings to attend in one year (including her brother, mother, father, and every one of her college girlfriends), Joy finds herself in a nightmare that will not seem to end. With every wedding she attends, Joy starts to question her beliefs, her relationship, and the institution of marriage itself. This book was okay. Not great... not horrible... but okay. It was pretty much what you would expect from a rom-com style of book. A quick read, a few corny jokes, and a lighthearted feel. It felt a little too much like the movie 27 Dresses at certain points in the story... but it was very different at the same time. I wasn't too impressed with the ending, the dialog was a bit too much at times (lots of puns and witty remarks... way too many piled into one conversation), and I couldn't stand the main character. The book did keep me interested enough to finish it though. It took me a while to get into... the middle part interested me the most... and then the ending was just okay. I am sure that my thoughts about this book have more to do with the fact that it just isn't my favorite style of writing than it does with the content. As I've stated before, I prefer more serious books. So, if you are into the quick and easy reads... I say try it out. I could take it or leave it.